Warning: Jaws Has Nothing On Youth Groups And Youth Pastors! 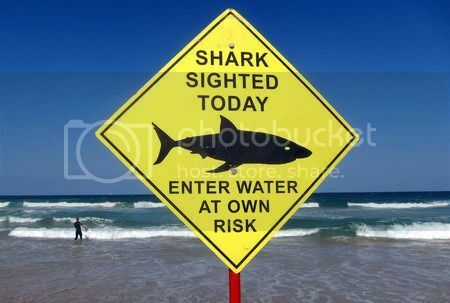 Go to any beach or park this Summer and you're sure to find some kind of "Caution" or "Warning" sign attempting to alert you to the very real dangers that exist that could mean the difference between life and death for you and for others. If only our churches and schools were as pragmatic and wise! I mean, the Lord tells us quite clearly that it only takes "a little leaven" to ruin the whole batch of dough (Galatians 5:9) so you'd think we'd be extra careful when it comes to entrusting our children and grandchildren to anything at all with a "Christian" label that could impact not just their impressionable hearts and minds, but also their very souls. We also know that God warns us through that same holy Word to expect that Satan is just looking for any opportunity to pounce on us at all times. 1 Peter 5:8 (ESV) Be sober-minded; be watchful. Your adversary the devil prowls around like a roaring lion, seeking someone to devour. Carrying the analogy I started one step further, perhaps it's best to think of this verse in light of the time of year we find ourselves in, and maybe we'd take it much more seriously if Satan were depicted here as a bloodthirsty shark instead of a roaring lion. Regardless, the point is that we believers should never let our guard down since the reality is that "Satan disguises himself as an angel of light" and "so it is no surprise if his servants, also, disguise themselves as servants of righteousness" (2 Corinthians 11:14-15). The cold hard truth is that even Christians who are extremely active in Youth Ministry could be causing great spiritual harm without even knowing it! No, "good intentions" is not enough, because sincerity does not automatically equal Biblical truth, passion and volume does not automatically mean you are doctrinally sound, and we all know that "The Road To Hell Was Paved With Good Intentions." Well, it wasn't too long ago when I attempted to point out the dangers with many Graduation Day speeches (and gifts) from Christians to other Christians. Hopefully, all of my fellow Lutherans who are reading this today survived that time of year. Now, the Summer is well underway, which means that you yourself, your kids, or your grandkids will likely be attending a Vacation Bible School or a Christian Camp And Retreat Center (if you haven't already). Thanks to some things a couple of Pastors shared in recent days, I feel obligated to provide you with the following Public Service Announcement to help you prepare for the "potential" dangers that lie ahead. Consider this your "Caution" or "Warning" sign for this Summer. If youth ministry is going to be about what the kids like, remember, they like being treated like adults. Second, Rev. Bryan Wolfmueller created and shared this handy checklist titled "How To Tell If You're Being Emotionally Manipulated By A Youth Speaker" that can be used not just during these Summer months, but year round. In case you're wondering what all the fuss is about, then I would strongly encourage you to spend some time with one or all of the following resources for an honest and eye-opening look at so-called "Youth Ministry," "Youth Groups," and "Youth Pastors" within Christianity. 'Youth Led Worship Services': Who Gets To Define Worship? I get that you might think that your way of doing Youth Ministry is "better" than most, but these are serious issues that cross denominational lines. Besides, is ministry (a.k.a. doctrine and practice) supposed to be defined by you and the youth in Christ's Church or by God through His Word? As one Lutheran Pastor said in his sermon addressing this topic, "pizza is great, but it isn't the Gospel!" So, give 'em the Gospel, which is the only "food" that can nourish and save their souls (Matthew 4:4; Luke 4:4; Romans 10:17)! Yes, I realize that there will be some of you who will read this who will take issue with those Pastors and even me for taking a stance like this primarily because you yourself are involved in Youth Ministry somehow or perhaps since you had a much more positive experience with it. However, please try to put your presuppositions aside and prayerfully consider the Biblical case that was made here today. We have to be honest and willing to talk about this. It's definitely not an easy thing to do within the current climate where the 11th Commandment of "Thou Shall Not Offend" reigns supreme even despite what God's Word has to say about things. Ok, so where do we go from here then? "Properly teaching vocation will go a long way in supporting home catechesis." "Lastly, stop and ask yourself what you believe about justification. If you truly don’t believe you can manipulate someone to faith, then stop acting as if you can. Stop the bait and switch tactics that are present in youth groups and adult small groups alike. Focus Sunday mornings on preaching the proper distinction between law and gospel, sin and grace, repentance and the forgiveness of sins. Cater Sunday service and youth ministry activities around teaching these things to the believers that are present. Sunday morning is not for the unbeliever, but for the believer. Focus on continually equipping believers to receive Christ’s gracious gifts so that they can leave service and serve their families and neighbors." Doesn't seem all that difficult, does it? We have to start somewhere though and there's no better place than in our own homes. But please don't misunderstand me either. What would be the wrong response to this attempt at having a serious discussion with our brothers and sisters in Christ after peeking behind the curtain that's hiding and protecting Youth Ministry and everything that's associated with it? The wrong response would be to do nothing and to simply take an apathetic approach and say something like, "Well, we already do catechesis in our home, so I'm not worried at all about the Youth Ministry program at our church, and neither should anyone else even if I agree with all the legitimate points you made." Believe me, sadly, I know far too many people who will respond that way! Instead, we must continue to do what we can to take an honest look at Youth Ministry, Youth Pastors, and Youth Groups and be willing to bring this subject up for discussion in our own church, if necessary. Let's not forget that the whole concept of Youth Ministry and everything that goes along with it is intricately tied to the so-called "Church Growth Movement" and we've already seen what a colossal and utter failure that has been. In a Lutheran layman's terms, be on guard this Summer, because spiritually speaking, Jaws has nothing on the run-of-the-mill Youth Groups and Youth Pastors!